September 10, 2017 at 2:10 pm. Filed under things we did not think we’d see: Casual Bob Stoops, shirt untucked, standing in a suite at Ohio Stadium, first-pumping the play of the Oklahoma Sooners in their victory over Ohio State. Now, a lot of that wouldn’t have made sense entering the summer, but Stoops’ stunning retirement cleared the way for precocious Lincoln Riley — he turned 34 last week — to move from hot-shot offensive coordinator to swaggy head coach of the Sooners. Then you mix Riley with Stoops’ recruiting efforts and the national leader in moxie — senior quarterback Baker Mayfield — and you get the most memorable moment from a wild Saturday night of college football: Mayfield unapologetically running to midfield and planting the Oklahoma flag into Ohio State’s turf after a 31-16 victory. 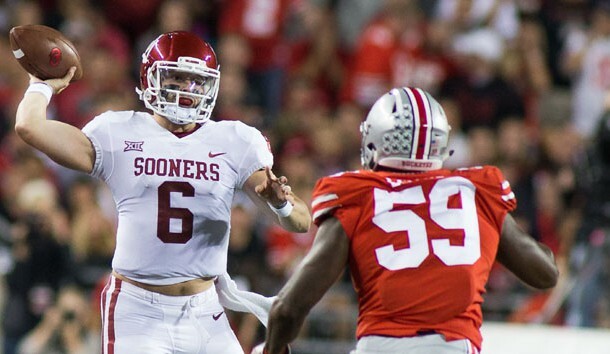 Mayfield said the celebration was an audible, but something like this had been brewing for about 365 days, even since the Buckeyes humbled Oklahoma last season in Norman on their way to the College Football Playoff. The Sooners recovered last season to win the Big 12 and their final 10 games but were never a serious playoff contender. Oklahoma rolled to 490 yards against a defensive line that Ohio State defensive coordinator Greg Schiano had called the best he’s coached — and that included his time leading the NFL’s Tampa Bay Buccaneers. Mayfield, savvy and slippery, completed 27 of 35 passes for 386 yards, with three touchdowns and no interceptions, despite losing his top target — tight end Mark Andrews — to injury in the second quarter. All that is great. Really great. But what plants the Sooners’ flag into legit national championship contender status is a defense that corralled Ohio State, showing plenty of three-man fronts after an offseason of talking about going to a four-man look. Hey, that other Stoops — defensive coordinator Mike — might be pretty savvy, too. Many of the preseason predictions called for the Big 12 to miss out, again, on the four-team playoff. Now, Oklahoma, with its victory Saturday night, is sitting pretty, likely buying itself margin of error. Toughest games left: vs. Texas in Dallas (hey, anything can happen), at Kansas State, at Oklahoma State, vs. TCU, Big 12 championship game. Losing one while winning the Big 12 title game still equals a playoff resume. Big Game Bob is gone. Welcome to Large Game Lincoln. He out-foxed Urban Meyer in his second game. 1. Notre Dame misses its statement opportunity. The Irish eked into the rankings last week, only to be ushered out by visiting 15th-ranked Georgia and its true freshman quarterback, Jake Fromm. And with prickly coach Brian Kelly showing up at the postgame press conference, it doesn’t look like enough has changed after a 4-8 season. 2. Ed Oliver is still Ed Oliver. Houston’s former five-five star recruit and 2016 Freshman All-American made his season debut Saturday night at Arizona. The defensive tackle dominated with 11 tackles, including 1.5 for loss, and a forced fumble. He’s been compared to Ndamukong Suh and Aaron Donald … and that might not be hyperbole. 3. The Benny Hill award goes to Louisiana Tech. The best blooper of the season happened when the Bulldogs had second-and-goal from the Mississippi State 6, fired a snap past quarterback J’Mar Smith, with the ball being bobbled and batted all the way down the field until Tech recovered at its 7. What’s the call for third-and-93? 4. It’s getting hotter in Arizona. Arizona State’s Todd Graham and Arizona’s Rich Rodriguez entered the season on the coaching hot seat, and the heat index reached “pants on fire” Saturday night. The Sun Devils lost at home to San Diego State; the Wildcats fell to Houston. Those are two of the best non-Power 5 conference teams, but they’re also games embattled coaches really needed to win. 5. We need more Pitt-Penn State. The rivalry was dormant from 2000 to 2016, when the Panthers beat the Nittany Lions early in the season. Penn State had little trouble Saturday, winning 33-14, but the knockout punch was delivered after the game by Lions coach James Franklin: “Last year for their win, it was like the Super Bowl, but for us this was just like beating Akron.” Thankfully, there is another home-and-home scheduled for the next two seasons before the rivalry goes back on hiatus. 6. Love this stat. Oklahoma QB Baker Mayfield has never lost in 10 true road games with the Sooners, passing for 35 touchdowns with just five interceptions. 7. Baylor has gone from scandal to bad at football. The Bears have lost to FCS Liberty and Texas-San Antonio to open the season. Neither of those programs had previously beaten a Power 5 conference team. 8. A good Penny turns up. San Diego State’s Rashaad Penny, in a starring role now that Donnel Pumphrey is in the NFL, put up 353 all-purpose yards late Saturday night against Arizona State, scoring on a 95-yard run, a 99-yard kick return and a 33-yard reception. Watch for him Saturday in a home game against Stanford. 9. Clemson isn’t going anywhere. The defending national champs are built to last. Most impressive in a 14-6 suffocation of Auburn: Dabo Swinney’s guy didn’t allow more than 17 yards on any of Auburn’s final 10 drives. 10. Wait, what? Eastern Michigan had never beaten a Power 5 conference team in 58 tries. And then it won at Rutgers. 1. QB Lamar Jackson, Louisville — Repeat Heisman winner? Jackson is physically stronger this season, is making more pocket passes and is still a human highlight reel with the ball in his hands. He has a national-best 1,010 yards of total offense in two games. 2. QB Baker Mayfield, Oklahoma — He’s completing 83.5 percent of his passes, with six touchdowns, no interceptions and one signature victory. 4. QB Josh Rosen, UCLA — Let’s pretend his season started with the fourth quarter against A&M. In the five quarters since then, “The Rosen One” has nine touchdown passes and no interceptions, throwing for 621 yards. 5. RB Saquon Barkley — He’s yet to be fully unleashed, but nothing so far has suggested that he’s anything except the best running back in the nation. 1. Clemson at Louisville (Saturday, 3:30 p.m. ET). Heisman-winning Lamar Jackson vs. the nation’s best defensive line. Yes, please. 2. Tennessee at Florida (Saturday, 3:30 p.m. ET). As of early Sunday afternoon, the chatter was about finding a new location of the game following Hurricane Irma; either way, this is a great matchup of ranked teams coming a season after the Vols scored 38 consecutive points in a 38-38 victory that snapped an 11-game skid to the Gators. 3. Texas at USC (Saturday, 8:30 p.m. ET). It’s not the 2006 Rose Bowl with the national title on the line, but it’ll do just fine. 4. LSU at Mississippi State (Saturday, 7 p.m. ET). A potential trouble spot on the road for the Tigers’ stout defense, going against Bulldogs’ dual-threat quarterback Nick Fitzgerald. 5. Oregon at Wyoming (Saturday, 7 p.m. ET). The Ducks aren’t all the way back, but they sure ain’t boring and the scoreboard should be busy when they take on Wyoming’s hot NFL prospect, quarterback Josh Allen.